Focusing on the theme of healthy people/healthy places, the overall aim of Te Aho Tapu is to build knowledge around mātauranga Māori-driven theory, research, decision making and action through working across community-driven projects, based on aspirations and actions generated by those communities. 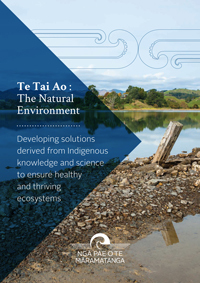 Te Aho Tapu involves collaborations of a number of initiatives as they design and implement action research cycles of specific studies that address the key aspirations and opportunities in relation to environmental integrity and health and wellbeing. Methods vary from site to site but will include interviews, monitoring and evaluation of initiatives. A key outcome is to provide sustainable solutions (cultural, economic, social and environmental) for the benefit of the numerous stakeholders, their whānau and the wider community. The project will allow for expansion over time, with potential for new sites to join with established work. The project involves multiple national and international linkages, enabling sharing of indigenous knowledge and approaches to a global issue. What evidence and actions in this domain are needed to improve Māori and national health? What are the dimensions of an environment based experience that can be applied to promote Maori health and wellbeing? By focusing on these questions, Te Aho Tapu will provide learnings specific to the project and contribute learnings to answer the overall theme questions. In addition, during the planning phase, specific questions will be developed with the site communities.